Aside from the psychiatric diagnoses, psychological traits such as alexithymia and impulsiveness have also been studied in relation to NSSI. Alexithymia is defined as a personality construct featuring a subclinical inability to identify and describe emotions in the self,23 and it seems to correlate somehow with the onset of NSSI. Some authors, including Paivio and McCullogh,24 have observed this relationship between NSSI and alexithymia and found that more severe clinical presentations of NSSI were associated with higher levels of alexithymia.24–27 Findings concerning impulsiveness have been inconsistent: some researchers report that self-injurers perceive themselves as more impulsive in answering self-report questionnaires,18,28–30 while other studies using behavioral measures of impulsiveness found no differences vis-à-vis the general population.29,31 So the debate on the link between NSSI and impulsiveness remains open. It seems clear that a better understanding of NSSI comorbidities is crucial to improve our ability to assess, treat, and prevent self-injuring behavior, and hence this study, which aimed to conduct a more in-depth analysis of the broad array of psychological and psychiatric correlates of NSSI. We focused particularly on the relationships between NSSI, internalizing and externalizing psychobehavioral problems, specific psychological traits (such as alexithymia and impulsiveness), and sociorelational aspects. We expected clinical subjects to present worse psychopathological symptoms when compared to control cases. Particularly, concerning alexithymic traits, we wanted to demonstrate the importance of the lack in the ability of managing and communicating negative emotions as one of the mechanisms behind NSSI. In reference to impulsiveness, we hypothesized that greater levels of impulsivity, especially in terms of nonplanning impulsiveness and motor impulsiveness, could be related to an increase in frequency and severity of the disorder. We think that a better investigation of the role of alexithymia and impulsiveness as NSSI correlates would help, in terms of clinical implications and in planning primary and secondary preventive interventions. Among 88 young people attending a neuropsychiatry unit for children, adolescents, and families (Struttura Complessa Infanzia Adolescenza Famiglia) run by the Italian National Health Service (Unità Locale Socio Sanitaria Padova 16) in Padua (Italy) from January to December 2014, we selected 38 adolescents, consecutively referred to the service between January and October, who presented, during this time, episodes of NSSI. Five of these patients refused to take part in the research, while the remainder of the adolescents and their parents gave written informed consent to the study (our service has a protocol based on the use of standardized forms for obtaining informed consent to the administration of questionnaires and the collection of data for clinical and research purposes, approved by Institution ULSS 16 of Padua). The study was approved by the Research Commitee of the Struttura Complessa Infanzia Adolescenza Famiglia (SCIAF) – Ulss 16 Padova – and the principles outlined in the Declaration of Helsinki were followed. Our final clinical sample thus consisted of 33 adolescents (and their parents), 8 males (24.2% of the sample), and 25 females (75.8%), aged from 12 to 17 years (mean =15 years, standard deviation [SD] =1.37). The control group was recruited from among students attending three local high schools during the academic year 2014–2015. After an informative interview with the headmaster, parents were given a letter describing the research project, providing details of the test methods, and requesting that they sign a form to authorize the adolescent’s participation. The questionnaires administered to the controls were the same as those administered to the cases, and were completed anonymously in class during normal school hours, in compliance with current legislation on privacy, and in the presence of an operator from our service. The adolescents were given copies of the Child Behavior Checklist (CBCL) questionnaire to be answered by their parents, asking them to return them to a teacher appointed to collect them within a week. In all, 87 students took part in the study; eight (9.2%) were subsequently ruled out because they admitted in the questionnaire to having taken some self-harming action, and so the group of controls considered in the statistical analysis amounted to 79 students, 9 males (11.4% of the sample) and 70 females (88.6%), aged from 13 to 18 years (mean =15.37 years, SD =1.17). The prevalence of females among the controls was consistent with the type of the school (focusing on foreign languages), which was chosen deliberately to mimic the clinical sample. The questionnaires used in the study (see list in “Study protocol and materials” section) were completed by patients at the time of clinical interviews for their assessment at our unit and, where applicable, by their parents (who were asked to answer the questionnaire jointly). During interviews with patients, we recorded their clinical history, the clinical aspects of their self-harming behavior, their reason for seeking our clinical service, and their diagnosis, formulated according to the international classification of diseases-10 (ICD-10) criteria. The clinical sample was divided on the grounds of certain characteristics, as outlined below. presenting with disorders of scholastic skills: two cases. behavioral and/or personality disorders: this category includes 14 patients (42.4% of the clinical population), 6 males and 8 females (Table 2). habitual self-injury: patients with five or more such episodes/year; this category included 20 patients (60.6% of the sample), 3 males and 17 females. Abbreviation: ICD-10, international classification of diseases-10. A case–control study design was adopted. The cases and controls were administered six questionnaires, five of them – the Youth Self-Report (YSR), Barratt’s Impulsiveness Scale (BIS-11), the Toronto Alexithymia Scale (TAS-20), the Children’s Depression Inventory (CDI), and the Symptom Checklist-90-R (SCL-90-R) – were completed by the adolescents, while the last – the CBCL – was answered by the adolescents’ parents (or legal guardians). The scores obtained were first compared between cases and controls. Then comparisons were drawn between the groups into which the clinical sample was further divided. The Achenbach questionnaires are among the most commonly used scales for rating juvenile behavior and are used internationally in the clinical setting and in research.32,33 We used two questionnaires, one completed by the adolescents (YSR 11–18) and one by their parents (CBCL 6–18). These questionnaires yield two profiles: one for competences (activities, social functioning, and school performance), which tells about how good the adolescent is in sports, hobbies, autonomy capacities and socialization, and school practices; the other for behavioral and emotional problems, which can be assessed as “normal”, “borderline”, or “clinical” on eight specific syndrome scales. The syndrome scales relating to the various psychopathological pictures are as follows: anxiety/depression, withdrawal, somatization, social problems, thought-related problems, attention problems, aggressive, and rule-breaking behavior. The problems are grouped into: internalizing problems (anxiety, depression, withdrawal, and somatization); externalizing problems (aggressive and rule-breaking behavior); and other problems (social, thought-related, and attention problems). The revised version of the SCL-90-R34 is a 90-item self-report questionnaire for assessing psychopathological traits. This instrument sheds light on a broad range of psychological issues and psychopathological symptoms. The instrument is also useful for measuring patients’ progress or treatment outcomes. The various items assess nine symptom dimensions: somatization, obsessive-compulsive, interpersonal sensitivity, depression, anxiety, hostility, phobic anxiety, paranoid ideation, and psychoticism. Descriptive statistics were obtained for the scores emerging from the various tests, calculating the means, medians, standard deviations, and first and third quartiles. Frequency statistics were calculated for the categorical variables relating to the characteristics of the population under study. Given the uneven number of individuals comprising the samples considered, the scores were compared with the Mann–Whitney nonparametric rank sum test. The χ2 test was used to assess the association between habitual self-injury and presentation to our service for NSSI. Reference was made to generalized linear models with a mixed design for repeated measures, characterized by within and between variables, to assess the association between externalizing problems and total problems in the YSR and CBCL scores and the frequency of the NSSI. All statistical tests were two-way, and the threshold for significance was set at P<0.05. The data analysis was conducted with the SPSS (Statistical Package for Social Science, IBM® SPSS® Statistics 22.0 for Windows; IBM Corp., Armonk, NY, USA). 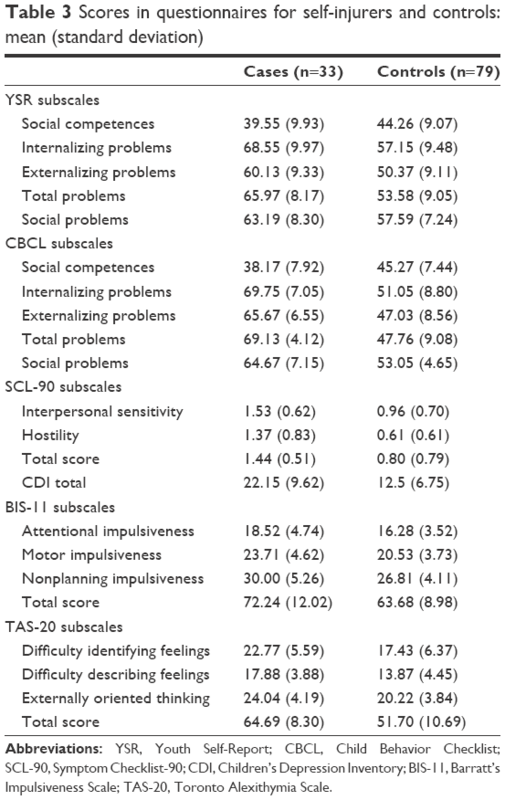 The following scales were considered for statistical purposes: social competences, internalizing problems, total problems, and social problems in the YSR and CBCL questionnaires; interpersonal sensitivity, hostility, and total score in the SCL-90; total score in the CDI; attentional impulsiveness, motor impulsiveness, nonplanning impulsiveness, and total score in the BIS-11; and difficulty identifying feelings, difficulty describing feelings, externally oriented thinking, and total score in the TAS-20. According to the hypothesis, we expected clinical subjects to present worse psychopathological symptoms when compared to control cases. Results are reported in Table 3. Abbreviations: YSR, Youth Self-Report; CBCL, Child Behavior Checklist; SCL-90, Symptom Checklist-90; CDI, Children’s Depression Inventory; BIS-11, Barratt’s Impulsiveness Scale; TAS-20, Toronto Alexithymia Scale. All NSSI cases had a total score above the threshold for borderline or clinical alexithymia: 73.1% of them were above the clinical cut-off (total score ≥61), and the other 26.9% ranged between borderline cut-off (total score ≥51) and the clinical cut-off. After the analysis based on cases–controls comparison, we performed a study about characteristics upon which we had divided the sample: reason for accessing our service, ICD-10 diagnosis, and frequency of self-injury episodes. Patients who came to our clinical service for reasons other than NSSI scored higher on the externalizing problems scale (Z=−3.021, P<0.05), and total problems scale (Z=−2.129, P<0.05) of the CBCL (Table 4). 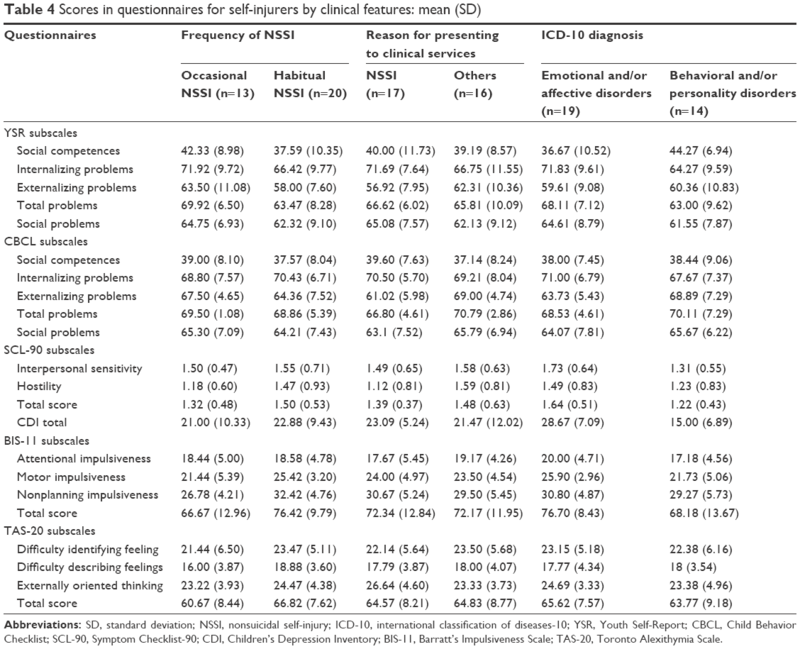 Analyzing diagnosis by ICD-10 versus dimensional categories, we found coherent results: a diagnosis of behavior and/or personality disorder coincided with a higher score on the externalizing problems scale of the CBCL (Z=−2.450, P<0.05), while patients with affective and/or emotional disorders had a higher total score in the SCL-90 (Z=−2.062, P<0.05), more depressive symptoms (CDI total score, Z=−3.581, P<0.05), and higher BIS-11 scores for nonplanning impulsiveness (Z=−2.084, P<0.05; Table 4). Abbreviations: SD, standard deviation; NSSI, nonsuicidal self-injury; ICD-10, international classification of diseases-10; YSR, Youth Self-Report; CBCL, Child Behavior Checklist; SCL-90, Symptom Checklist-90; CDI, Children’s Depression Inventory; BIS-11, Barratt’s Impulsiveness Scale; TAS-20, Toronto Alexithymia Scale. A χ2 test was then run to test the assumption that habitual self-injurers (with ≥5 episodes a year) come to the clinical service more frequently than occasional self-injurers, and the results confirmed this difference (Pearson’s χ2 test χ2(df=1) =6.945; P<0.05). Again considering the frequency of the NSSI behavior, habitual self-injurers (≥5 episodes a year) returned higher scores than occasional self-injurers on the nonplanning impulsiveness scale of the BIS-11 (Z=−2.351, P<0.05), and on the total score in the TAS-20 (Z=−1.971, P<0.05), whereas occasional self-injurers scored higher on the YSR total problems scale (Z=−2.136, P<0.05), as listed in Table 4. A generalized linear mixed model for repeated measures was used, considering the respondent (patient–YSR or parents–CBCL) as a within variable, and NSSI frequency (occasional versus habitual) as a between variable. We found a statistically significant difference in the scores on the externalizing problems scale for the within variable (F1,22=8.312, P<0.05). No differences emerged when the internalizing problems or total problems scales were considered. We conducted this study expecting clinical subjects to present worse psychopathological symptoms when compared to controls, with particular interest toward alexithymia and impulsiveness. It follows the discussion about aims’ related data presented earlier, after some considerations about demographic and clinical features describing the subjects involved in this study. The age of our clinical sample – mean 15 (range: 12–17) years – confirms that the onset of NSSI is generally around 14 years of age.6 The maximum age of 17 years was due to the nature of the service provided at our developmental neuropsychiatry unit, which is for the diagnosis, treatment, and rehabilitation of children and adolescents up until they turn 18 years. When we analyzed the results of the SCL-90, we found a statistically significant difference in the parameters considered, ie, interpersonal sensitivity, hostility, and global score. We thus concluded that, in addition to a higher overall rate of psychiatric symptoms, NSSI adolescents have a greater difficulty with interpersonal relations, demonstrating sentiments of personal inadequacy and inferiority, and also aggressiveness and rage, in relation to others. This difficulty in their relations with others is also confirmed by their scores on the scales for social competence and social problems, as assessed with the YSR and CBCL: NSSI adolescents reported having difficult interpersonal relations, and their parents’ observations confirmed as much. Distorted interpersonal relationships have been described in numerous studies, particularly in the light of the social function of behavior: You et al46 identified adolescents’ relational frailty as a factor of diminished resistance to negative behavioral influences of their peers, and Hawton et al5 mentioned interpersonal difficulties among the risk factors for the onset of NSSI. Brunner et al6 also found a higher prevalence of problems with social relations among NSSI cases than in controls. As for the clinical implications, these findings on the association between NSSI and inadequate sociorelational competences suggest that intervention focusing on improving communication and social skills (using psychotherapeutic methods such as dialectic-behavioral therapy, for instance, which focuses on developing interpersonal competences) could prove beneficial in the adolescent NSSI setting. Concerning the frequency of the NSSI episodes, our occasional self-injurers obtained higher YSR scores than the habitual cases, with a significant difference on the scale for total problems. This finding seems to contradict the report by Brunner et al,6 who found more severe psychopathological variables coinciding with a greater frequency of the NSSI episodes. It is important to add that Brunner et al6 examined a broad sample of adolescents by means of a population study, whereas we considered patients presenting to our developmental neuropsychiatry service. The proportion of self-injurers in the general population who turn to the medical services for help is limited.5 Our unit sees more cases of habitual than of occasional self-injuring adolescents and it seems likely that our clinical sample of occasional NSSI cases does not fully represent the occasional self-injurers in the adolescent population at large. To be more specific, using the χ2 test, we found that the occasional self-injurers coming under our observation had more often than not initially come to our service for other types of problem, and this would explain their higher scores obtained in the YSR. When we analyzed the clinical sample by ICD-10 diagnosis – affective/emotional disorders or personality/conduct disorders – we found significantly higher global scores on the SCL-90 and CDI for NSSI cases with the former diagnoses. This result is attributable to the type of psychopathological comorbidity concerned: patients with mood disorders, neurotic disorders, or disorders of the emotional sphere will predictably score higher in tests assessing depressive symptoms (CDI), or including subscales that assess somatization, anxiety, depression, or phobic anxiety (SCL-90), that is, psychopathologies with an internalizing type of psychobehavioral expression. On the other hand, patients diagnosed with behavioral and/or personality disorders consistently revealed higher scores on the scale for externalizing problems in the CBCL: this scale assesses the parents’ perception of their child’s behavior revealing loss of control, rage, hyperactivity, distractibility, antisocial, or aggressive behavior – situations characteristic of the conditions in the category of the behavioral disorders. Finally, we analyzed the mixed-design generalized linear models for repeated measures, considering respondents (patients in the case of the YSR, and parents in the case of the CBCL) as within variables, and occasional or habitual NSSI as the between variable. We found a statistically significant difference for the “respondent” variable as concerns externalizing problems, with parents tending to report more severe externalizing problems than their offspring. Although some studies have found a weak consistency between YSR and CBCL scores on the scales for externalizing problems,50,51 our result may be due to the ego-syntonic nature of NSSI behavior. In fact, individuals take such action deliberately and, from the patients’ point of view, it serves as a solution for coping with emotional problems that they have to face. One of the main objectives of our study was to better investigate the role of alexithymia in the onset of NSSI. As previously stated, we expected clinical sample to show greater levels of alexithymia when compared with the control group. An important finding in our clinical sample is that 100% of the TAS-20 questionnaires administered to our patients obtained total scores above 51, the cut-off for distinguishing between normality and borderline or clinical alexithymia. Among the controls, the proportion of individuals above this threshold was 41.8%. Judging from these results, difficulties in identifying and communicating emotions seem to be characteristic of the psychological functioning of NSSI adolescents, confirming our initial hypothesis. Selby and Joiner55 suggested that one of the mechanisms behind NSSI is a difficulty in managing negative emotions, and our results would support their view, suggesting a correlation between psychological dysfunctioning in this area and self-injuring behavior. Impulsiveness was assessed by administering the BIS-11 questionnaire. The comparison between the clinical and control groups revealed a significant difference in all the subscales of the questionnaire, as well as in the total scores, indicating that impulsiveness is one of the traits of the clinical population. This finding supports previous studies on the topic,18,28,29 in which self-report measures identified a significant difference between self-injuring adolescents and controls, confirming our initial hypothesis. Nevertheless, other investigations conducted using behavioral tests generated different results.28,29 It has been suggested that this inconsistency may be due to the sample recruitment processes used in the various studies, or to the heterogeneous nature of the reference populations. For the time being, however, we are unaware of any publications on impulsiveness and NSSI – in our local population (the Veneto region), or in Italian adolescents generally – with which to compare the data emerging from our research. Another plausible explanation could lie in the instruments used: a meta-analysis57 has demonstrated that the outcomes of self-report questionnaires and behavioral measures are not fully consistent when it comes to assessing impulsiveness. We might add that self-injuring adolescents are only impulsive in certain situations of particular emotional stress, which are difficult to replicate in the context of a behavioral study. Be that as it may, what emerges clearly from our data is that our sample of NSSI adolescents saw themselves as more impulsive than their peers in the control group. No statistically significant differences emerged from our comparison between patients coming to our service for NSSI as opposed to other reasons. On the other hand, there was a significant difference on the nonplanning impulsiveness scale between occasional and habitual self-injurers. Nonplanning impulsiveness can be defined as an inadequate ability to think ahead, and our finding may indicate that habitual self-injurers have more difficulty in assessing their actions, particularly as concerns their ability to reflect on the possible consequences of an action before they put it into practice. We found no differences on the scale of motor impulsiveness, defined as the tendency to take action without stopping to think. This would mean that repeated NSSI are not induced by habitual self-injurers’ greater difficulty in controlling their impulses – a trait shared by all self-injurers (irrespective of the frequency of such actions) by comparison with the general population. So, motor impulsiveness would seem to be important in the onset of NSSI behavior rather than the frequency of the episodes. Motor impulsiveness was the only significant parameter emerging from the comparison between the subgroups of the clinical sample divided by ICD-10 diagnosis: patients with affective and/or emotional disorders scored higher than patients diagnosed with behavioral and/or personality disorders. We can interpret this finding in the light of the demonstrated association between NSSI and impulsiveness, also bearing in mind that disorders of internalizing type are the most common psychiatric comorbidity associated with NSSI. As a consequence, adolescents with NSSI and a concomitant internalizing type of disorder have a tendency to reveal higher scores in this dimension of impulsiveness. In general, we can say that, irrespective of its clinical characteristics, NSSI reveals associations with a variety of psychiatric conditions rather than presenting any specific link with a particular diagnostic category. NSSI can be seen as a disorder that spans the various categories of psychopathology examined in this study, justifying the increasing tendency to see NSSI as a separate pathological entity. Proof of this tendency lies in the recent adoption in the DSM-V of separate diagnostic criteria for NSSI, which is no longer relegated to the role of a symptom of borderline personality disorder. From a formal standpoint, this separation of NSSI from borderline personality disorder in the classification allows for the co-occurrence of NSSI with other psychiatric disorders – a situation that, judging from the results of this study, appears to be far from rare. With regard to impulsiveness, it emerged as a trait shared by all self-injurers. A significant difference on the nonplanning impulsiveness scale between occasional and repetitive NSSI came out when considering the clinical population, while motor impulsiveness seems to be more important to the self-injuring onset. Given the discordance among studies, further investigations are needed about the NSSI–impulsiveness relationship. Our study has some limitations that need to be acknowledged. First of all, there is the limited size of the clinical sample considered, which made it impossible for us to further divide our cases into subgroups (beyond those considered here) for statistical reasons. Another limitation concerns our exclusive use of self-reporting assessment tools. Although they have their advantages (they are quick and easy to administer, inexpensive, and obtain an abundance of information directly from the individual concerned), this type of assessment suffers from the risk of the responses being influenced by factors such as social desirability, subjective interpretation of the questions, and the respondent’s influence ability, although the presence of an operator enabled errors due to an inappropriate interpretation of the question to be reduced, and our tests could be suspended and repeated if situations arose that might interfere with the questionnaires’ adequate completion. Albeit with these limitations, this study provides an important contribution on the topic of self-injury, given also that few reports in the literature have analyzed such a large number of variables. There has so far been a general paucity of research on alexithymia and impulsiveness in NSSI patients, and the number of studies on the Italian population, and in the area of the Veneto, is extremely limited. Nock MK. Self-injury. Annu Rev Clin Psychol. 2010;6:339–363. American Psychiatric Association. Diagnostic and Statistical Manual of Mental Disorders (DSM-V). 5th ed. Arlington, VA: American Psychiatric Publishing; 2013. Swannell SV, Martin GE, Page A, Hasking P, St John NJ. Prevalence of nonsuicidal self-injury in nonclinical samples: systematic review, meta-analysis and meta-regression. Suicide Life Threat Behav. 2014;44(3):273–303. Muehlenkamp JJ, Claes L, Havertape L, Plener PL. International prevalence of adolescent non-suicidal self-injury and deliberate self-harm. Child Adolesc Psychiatry Ment Health. 2012;6:10. Hawton K, Saunders KE, O’Connor RC. Self-harm and suicide in adolescents. Lancet. 2012;379(9834):2373–2382. Brunner R, Kaess M, Parzer P, et al. Life-time prevalence and psychosocial correlates of adolescent direct self-injurious behavior: a comparative study of findings in 11 European countries. J Child Psychol Psychiatry. 2014;55(4):337–348. Laukkanen E, Rissanen M, Tolmunen T, Kylmä J, Hintikka J. Adolescent self-cutting elsewhere than on the arms reveals more serious psychiatric symptoms. Eur Child Adolesc Psychiatry. 2013;22(8):501–510. Claes L, Vandereycken W, Vertommen H. Self-injury in female versus male psychiatric patients: a comparison of characteristics, psychopathology and aggression regulation. Pers Individ Dif. 2007;42(4):611–621. Kirkcaldy BD, Brown J, Siefen RG. Disruptive behavioural disorders, self harm and suicidal ideation among German adolescents in psychiatric care. Int J Adolesc Med Health. 2006;18(4):597–614. Saçarçelik G, Türkcan A, Güveli H, Yesilbas D. The prevalence of deliberate self-harm behavior and its association with sociodemographic features in patients referred to secondary care psychiatric clinic for adolescents and young adults. Dusunen Adam. 2011;24(4):253–264. Cerutti R, Manca M, Presaghi F, Gratz KL. Prevalence and clinical correlates of deliberate self-harm among a community sample of Italian adolescents. J Adolesc. 2011;34(2):337–347. Manca M, Presaghi F, Cerutti R. Clinical specificity of acute versus chronic self-injury: measurement and evaluation of repetitive non-suicidal self-injury. Psychiatry Res. 2014;215(1):111–119. Di Pierro R, Sarno I, Perego S, Gallucci M, Madeddu F. Adolescent nonsuicidal self-injury: the effects of personality traits, family relationships and maltreatment on the presence and severity of behaviours. Eur Child Adolesc Psychiatry. 2012;21(9):511–520. Nock MK, Joiner TE Jr, Gordon KH, Lloyd-Richardson E, Prinstein MJ. Non-suicidal self-injury among adolescents: diagnostic correlates and relation to suicide attempts. Psychiatry Res. 2006;144(1):65–72. Brunner R, Parzer P, Haffner J, et al. Prevalence and psychological correlates of occasional and repetitive deliberate self-harm in adolescents. Arch Pediatr Adolesc Med. 2007;161(7):641–649. Lloyd-Richardson EE, Perrine N, Dierker L, Kelley ML. Characteristics and functions of non-suicidal self-injury in a community sample of adolescents. Psychol Med. 2007;37(8):1183–1192. Rodav O, Levy S, Hamdan S. Clinical characteristics and functions of non-suicide self-injury in youth. Eur Psychiatry. 2014;29(8):503–508. Hintikka J, Tolmunen T, Rissanen M, Honkalampi K, Kylmä J, Laukkanen E. Mental disorders in self-cutting adolescents. J Adolesc Health. 2009;44(5):464–467. Kumar G, Pepe D, Steer RA. Adolescent psychiatric inpatients’ self-reported reasons for cutting themselves. J Nerv Ment Dis. 2004;192(12):830–836. Claes L, Vandereycken W, Vertommen H. Eating-disordered patients with and without self-injurious behaviours: a comparison of psychopathological features. Eur Eat Disord Rev. 2003;11(5):379–396. Solano R, Fernández-Aranda F, Aitken A, López C, Vallejo J. Self-injurious behaviour in people with eating disorders. Eur Eat Disord Rev. 2005;13(1):3–10. Nemiah JC, Freyberger H, Sifneos PE. Alexithymia: a view of the psychosomatic process. In: Hill OW, editor. Modern Trends in Psychosomatic Medicine. Vol 3. London, England: Butterworths; 1976:430–439. Paivio SC, McCulloch CR. Alexithymia as a mediator between childhood trauma and self-injurious behaviors. Child Abuse Negl. 2004;28(3):339–354. Zlotnick C, Shea MT, Pearlstein T, Simpson E, Costello E, Begin A. The relationship between dissociative symptoms, alexithymia, impulsivity, sexual abuse, and self-mutilation. Compr Psychiatry. 1996;37(1):12–16. Evren C, Evren B. Self-mutilation in substance-dependent patients and relationship with childhood abuse and neglect, alexithymia and temperament and character dimensions of personality. Drug Alcohol Depend. 2005;80(1):15–22. Polk E, Liss M. Psychological characteristics of self-injurious behavior. Pers Individ Dif. 2007;43(3):567–577. Glenn CR, Klonsky ED. A multimethod analysis of impulsivity in nonsuicidal self-injury. Personal Disord. 2010;1(1):67–75. Janis IB, Nock MK. Are self-injurers impulsive? results from two behavioral laboratory studies. Psychiatry Res. 2009;169(3):261–267. Herpertz S, Sass H, Favazza A. Impulsivity in self-mutilative behavior: psychometric and biological findings. J Psychiatr Res. 1997;31(4):451–465. Manual for the ASEBA School-Age Forms & Profiles; 2001. Achenbach, TM, Rescorla, LA. Burlington, VT: University of Vermont, Research Center for Children, Youth, and Families. Ivanova MY, Achenbach TM, Rescorla LA, et al. The generalizability of the Youth Self-Report syndrome structure in 23 societies. J Consult Clin Psychol. 2007;75(5):729–738. Frigerio A, Vanzin L, Pastore V, et al. The Italian preadolescent mental health project (PrISMA): rationale and methods. Int J Methods Psychiatr Res. 2006;15(1):22–35. Derogatis LR. Symptom Checklist 90–R: Administration, Scoring, and Procedures Manual. 3rd ed. Minneapolis, MN: National Computer Systems; 1994. Kovacs M. Children’s Depression Inventory (CDI) manual. Toronto, ON: Multi-Health Systems; 1992. Camuffo M, Cerutti R, Lucarelli L, Mayer R. Il CDI (Children’s Depression Inventory) nella scuola media: indagine psicometrica. Bollettino di Psicologia Applicata. 1988a;185:37–46. Italian. Camuffo M, Cerutti R, Lucarelli L, Mayer R. Children’s depression inventory: Italian version. Firenze, Italy: Organizzazioni Speciali; 1988b. Stanford MS, Mathias CW, Dougherty DM, Lake SL, Anderson NE, Patton JH. Fifty years of the Barratt Impulsiveness Scale: an update and review. Pers Individ Dif. 2009;47(5):385–395. Fossati A, Barratt ES, Acquarini E, Di Ceglie A. Psychometric properties of an adolescent version of the Barratt Impulsiveness Scale-11 for a sample of Italian high school students. Percept Mot Skills. 2002;95(2):621–635. Rieffe C, Oosterveld P, Terwogt MM. An alexithymia questionnaire for children: factorial and concurrent validation results. Pers Individ Dif. 2006;40(1):123–133. Madge N, Hewitt A, Hawton K, et al. Deliberate self-harm within an international community sample of young people: comparative findings from the child & adolescent self-harm in Europe (CASE) study. J Child Psychol Psychiatry. 2008;49(6):667–677. Andover MS, Gibb BE. Non-suicidal self-injury, attempted suicide, and suicidal intent among psychiatric inpatients. Psychiatry Res. 2010;178(1):101–105. Baetens I, Claes L, Muehlenkamp J, Grietens H, Onghena P. Differences in psychological symptoms and self-competencies in non-suicidal self-injurious Flemish adolescents. J Adolesc. 2012;35(3):753–759. You J, Lin MP, Fu K, Leung F. The best friend and friendship group influence on adolescent nonsuicidal self-injury. J Abnorm Child Psychol. 2013;41(6):993–1004. Baetens I, Claes L, Onghena P, et al. Non-suicidal self-injury in adolescence: a longitudinal study of the relationship between NSSI, psychological distress and perceived parenting. J Adolesc. 2014;37(6):817–826. Baetens I, Claes L, Muehlenkamp J, Grietens H, Onghena P. Non-suicidal and suicidal self-injurious behavior among Flemish adolescents: a web-survey. Arch Suicide Res. 2011;15(1):56–67. Evans E, Hawton K, Rodham K. In what ways are adolescents who engage in self-harm or experience thoughts of self-harm different in terms of help-seeking, communication and coping strategies? J Adolesc. 2005;28(4):573–587. Salbach-Andrae H, Lenz K, Lehmkuhl U. Patterns of agreement among parent, teacher and youth ratings in a referred sample. Eur Psychiatry. 2009;24(5):345–351. Rescorla LA, Ginzburg S, Achenbach TM, et al. Cross-informant agreement between parent-reported and adolescent self-reported problems in 25 societies. J Clin Child Adolesc Psychol. 2013;42(2):262–273. Gatta M, Spoto A, Svanellini L, et al. Alliance with patient and collaboration with parents throughout the psychotherapeutic process with children and adolescents: a pilot study. Journal of Psychopathology. 2012;18:28–34. Gatta M, Ramaglioni E, Lai J, et al. Psychological and behavioral disease during developmental age: the importance of the alliance with parents. Neuropsychiatr Dis Treat. 2009;5:541–546. Cerutti R, Calabrese M, Valastro C. Alexithymia and personality disorders in the adolescent non-suicidal self injury: preliminary results. Soc Behav Sci. 2014;114:372–376. Selby EA, Joiner TE Jr. Cascades of emotion: The emergence of borderline personality disorder from emotional and behavioral dysregulation. Rev Gen Psychol. 2009;13(3):219–229. Gatta M, Balottin L, Mannarini S, et al. Familial factors relating to alexithymic traits in adolescents with psychiatric disorders. Clinical Psychologist. Epub 2016. Cyders MA, Coskunpinar A. Measurement of constructs using self-report and behavioral lab tasks: is there overlap in nomothetic span and construct representation for impulsivity? Clin Psychol Rev. 2011;31(6):965–982. Gatta M, Zotto L, Nequinio G, et al. Parents of adolescents with mental disorders: improving their caregiving experience. J Child Fam Stud. 2011;20:478–490. Gatta M, Dal Zotto L, Del Col L, et al. Analytical psychodrama with adolescents suffering from psycho-behavioral disorder: Short-term effects on psychiatric symptoms. Arts Psychother. 2010;37(3):240–247. Gatta M, Gallo C, Vianello M. Art therapy groups for adolescents with personality disorders. Arts Psychother. 2014;41:1–6.